September 7, 2014 was World Goddess Day. An initiative started by Brazilian Dianic priest Claudiney Prieto. To celebrate the Mama Dragon and her Minions put together a collection of Goddess inspire music from new age and Pagan musicians. Include in the show was the second (and third) portion of Phil’s interview with SJ Tucker and Betsy Tinney. On August 19, Sooj and Betsy were in Lincoln, NE to do a show at the Ferguson House, a concert sponsored by the Unitarian Church of Lincoln’s Wayward Concert Series and KZUM Community Radio. Sooj has been to Lincoln many times over the years, but this was Betsy’s first time. Featured along with the interview is a selection of music from both of these Goddesses on Earth. Murphy’s Magic Mess airs live every Sunday at 9am Central on KZUM-Lincoln/KZUM-HD 89.3FM and online at www.kzum.org. 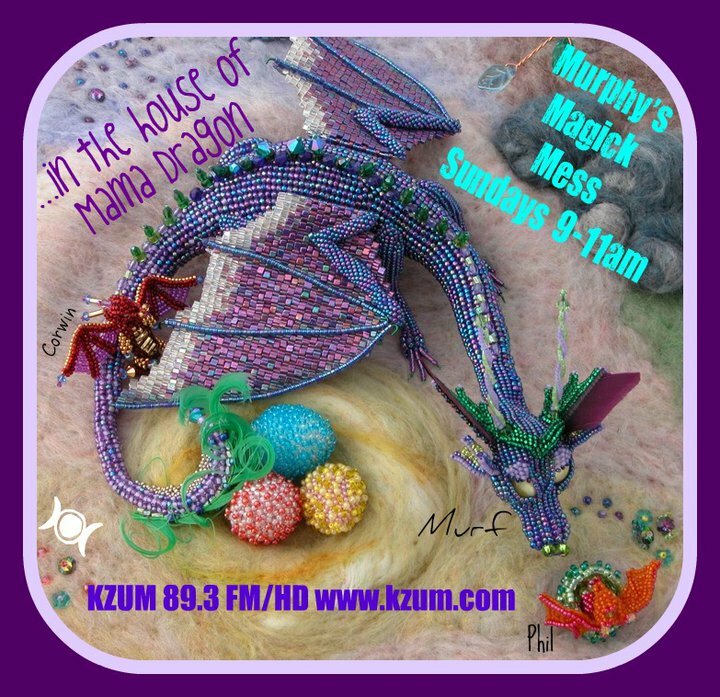 Murf and her minions have been bringing the KZUM family new age and Pagan music for over 20 years and is the world’s longest running Pagan content radio program. Thank you to *K8 to compiling the play list and to Michele for guesting on the show and representing the Order of the Red Grail, Church for Transformational Wicca-ATC. September 14, 2014 is Phil’s birthday show on the Mess. Be sure to tune in for two hours of some of his favorite new age and Pagan music. For the fifth year in a row Phil cobbled together a Blues program to fill the time slot for Murphy’s Magic Mess on KZUM. Every Labor Day Weekend KZUM preempts all programming for 83 hours of Blues. In the past this has been more of a challenge for Phil and the rest of the Mess, this year was different. The challenge was to whittle it down to two hours of music. Didn’t quite happen that way, he had 2 hours and 27 minutes of music and Murf joined the fun with another 47 minutes of music. Clearly not everything on their lists got played. Kate was off for the weekend attending a family gathering. Michelle and her husband stopped in briefly to share the fun of Murf’s birthday. The following is the played list of music. On Sunday 7 September 2014 we’ll return with our usual Mess of music and fun, plus the second half of the SJ Tucker and Betsy Tucker interview from 19 August. 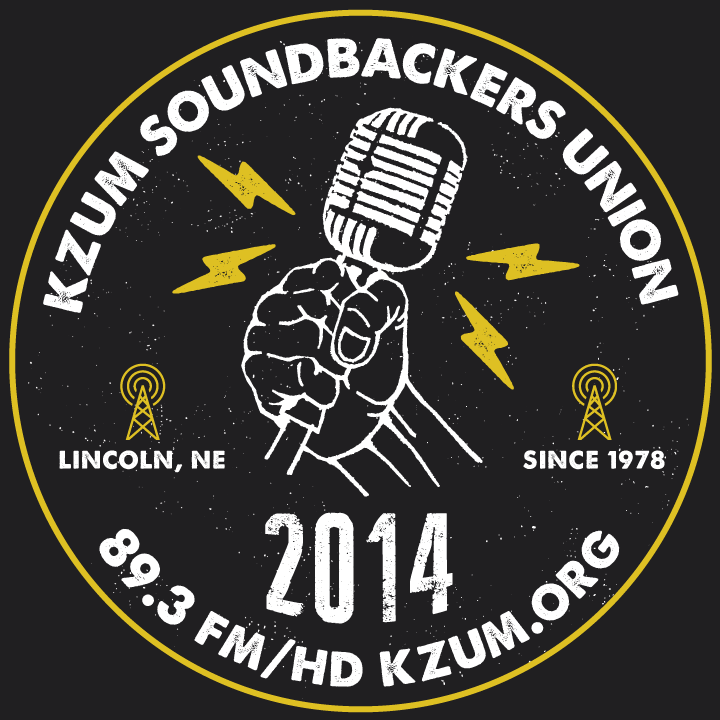 Last year started a new membership drive at KZUM, the Soundbackers Union. An exclusive group of member-listeners who get special benefits from KZUM – including discounted concert tickets, elite swag, and other exciting benefits. For one week every June the station does a fund raising campaign for the Soundbackers Union. Murphy’s Magic Mess put together a special playlist for the event. The campaign for the 2014 membership of the Soundbackers ends on the 23rd at midnight Central time, but KZUM is always open to new member-listeners and donations to support Nebraska’s first and only community radio station. Murphy’s Magic Mess airs live every Sunday morning at 9am Central, bringing the listener two hours of new age and Pagan music from around the world. Celebrating 20 years with KZUM, Murf, *K8, and Phil are thrilled to bring you a unique collection of music every week! Thank you to all our wonderful artists we get to play every week on Murphy’s Magic Mess on KZUM-HD in Lincoln, NE. We’d also like to thank all our wonderful listener-members who either renewed or became members of KZUM this past week during the spring 2014 pledge drive. You are who we do this for every week. Phil was in a sky and Spring mood Sunday morning, and the first several pieces reflect the sky and many of the rest reflect the call for Spring. Murf selected most of the second half of the show with a few contributions from Phil and some suggestions from *K8. A big kudos to *K8 for typing up the play list during the show. Phil has gone through any made any corrections that might have been needed. It was a real joy to see Sister Gladysteen in the studio. She is one of the hosts of Glorious Gospel on KZUM and one we do not get to see on a regular basis. We are looking forward to seeing here again now that Spring is starting to make itself known in our area. The first piece we played was for her, as Paul Spaeth’s CD is very spiritual. It was also selected to honor Dr. Rock who ended his tenure with KZUM – he hosted the six hour program Dr. Rock and the Medicine Show. Throughout the program we updated you on a couple of Elders in the global Pagan community. Donald Michael Kraig is in hospital and battling pancreatic cancer, the prognosis is not good. He is in good spirits, though. His family and friends have been at his side as much as possible and number of Pagans around the world have been lending their energy to him, to ease him and make him more comfortable at this time. Morning Glory Zell has also been in hospital, she is battling complications from her recurring cancer. She’s doing well. Will hopefully be returning home soon. A GoFundMe page has been set up to assist with the medical expenses incurred during MG’s hospital stay. Lastly, we spoke briefly about the murals at Alder Hey Children’s Hospital in England. Alder Hey is slated for demolition. The beautiful murals that are risk were painted by volunteer artists from across England, including singer-songwriter-multi-instrumentalist George Nicholas. George is the front man for Cernunnos Rising, whom we played a piece from towards the end of the show. There is an online petition to preserve the murals, you can find out more here.